In the middle 400's the pagan Anglo-Saxons invaded Britain, driving the Christian Britons north and west into Cornwall, Wales, Scotland, and Ireland. In 597 a band of monks headed by Saint Augustine of Canterbury, with the aide and blessing of Pope Gregory the Dialogist, arrived in southeastern England, in the kingdom of Kent, and began to evangelize the people there, with considerable success. In 601 a second group of monks arrived, including Paulinus (born around 584), together with sacred vessels, altar-cloths, and other ornaments for churches, vestments for priests, relics of the apostles and martyrs, and many books; decreeing by letters from Pope Gregory that when the northern countries should receive the faith, York should be appointed a metropolitan see, in like manner with Canterbury. Sometime after 616, Edwin, the pagan king of Northumbria (the region north of the Humber river--roughly the northern quarter of England), asked for the hand in marriage of Ethelburga, the sister of the king of Kent. He was told that a Christian princess could not marry a pagan, but he promised that she would be free to practice her religion, and that he would listen to Christian preachers, and seriously consider becoming a Christian himself. At this Ethelburga agreed to marry him, and went north in 625, taking with her as chaplain the monk Paulinus, who was consecrated bishop for the purpose by Archbishop Justus of Canterbury. Edwin heard the preaching of Paulinus for many months, and finally consulted his advisors. Coifi, the high priest of the pagan religion, advised adopting Christianity, since he said that the pagan religion had not proved satisfactory. Another nobleman agreed, saying: "Life is like a banquet hall. Inside is light and fire and warmth and feasting, but outside it is cold and dark. A sparrow flies in through a window at one end, flies the length of the hall, and out through a window at the other end. That is what life is like. At birth we emerge from the unknown, and for a brief while we are here on this earth, with a fair amount of comfort and happiness. But then we fly out the window at the other end, into the cold and dark and unknown future. If the new religion can lighten that darkness for us, then let us follow it." The other elders and counselors of the king gave similar advice, and so in 627 the king and many of his chief men were baptized. The king was baptized by Bishop Paulinus at York on Easter Sunday in 627, together with his son Osfrid, whom he had by a former wife. The ceremony was performed in a church of wood, raised in haste. King Edwin afterwards began one of stone, which was finished by Saint Oswald. Bede takes notice that churches and fonts not being yet built spacious enough for the crowds that flocked to receive baptism, Saint Paulinus, when the king resided amongst the Deiri, baptized in the river Swale, near Cataract, where the king’s palace stood. Among those baptized by Paulinus were Hilda, later the founding abbess of Whitby Abbey, and Hilda's successor, Eanflaed, Edwin's daughter. 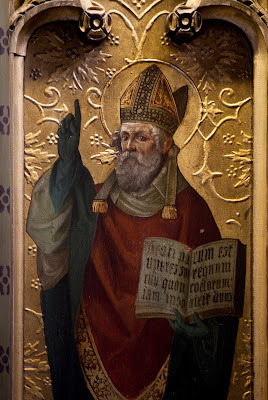 As the only Roman bishop in England, Paulinus also consecrated another Gregorian missionary, Honorius, as Archbishop of Canterbury after Justus' death, some time between 628 and 631. Other conversions followed, and the Church in Northumbria flourished. However, six years later, King Edwin was defeated and killed by Cadwallon of Wales and Penda of Mercia at the battle of Hatfield Chase. Paulinus left his deacon James in charge of what remained of the Church there, and took Queen Ethelburga and her children back to Kent by ship. There the elderly Paulinus was given the bishopric of Rochester, which he held till his death on 10 October 644, having been bishop nineteen years, says Bede (Paulinus sat first eight years at York, from 625 to 633, and afterwards eleven at Rochester, from 633 to 644, in all nineteen years and three months). Bede describes Paulinus as "a man tall of stature, a little stooping, with black hair and a thin face, a hooked and thin nose, his aspect both venerable and awe-inspiring."